The Creatalicious Teachers! : Art Attack!! 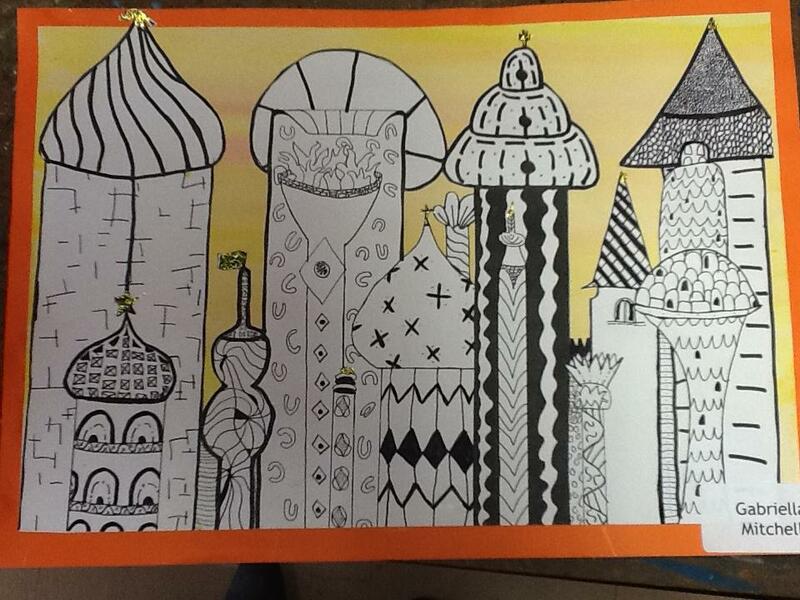 First term projects!! Art Attack!! First term projects!! 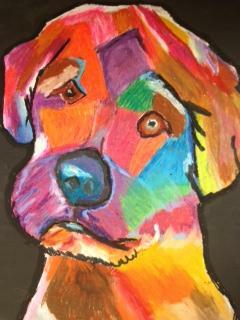 Grade 7 Cubist Style Dogs - Picasso! 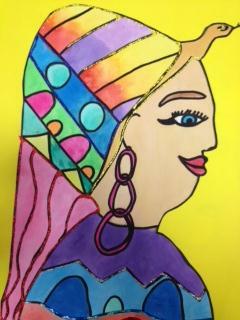 The grade 7's looked at the Cubist artist Picasso. 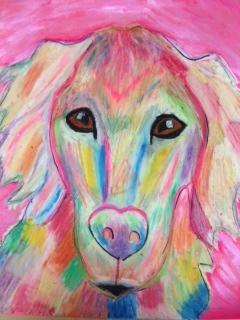 We decided to try to create large scale Picasso style dogs! 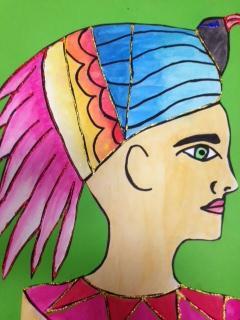 The children experimented with tones and shades of different areas of colours. 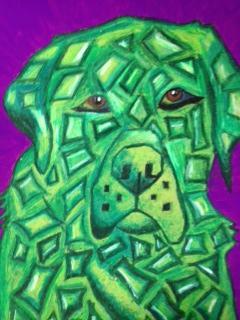 The dogs were done on size A1 paper with fluorescent pastels. 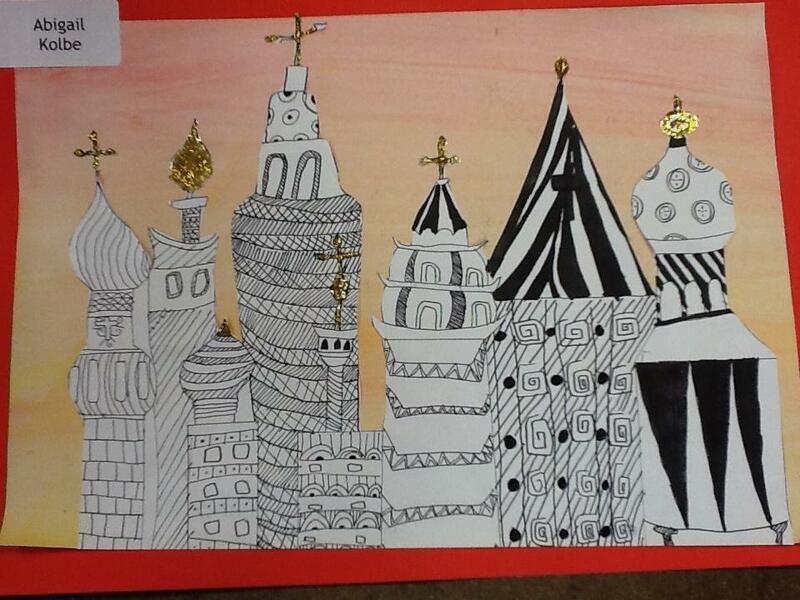 Metallic paint was used for the backgrounds. 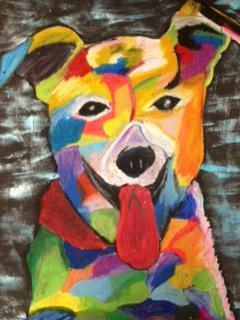 We are so proud of these dogs and excited to see how each individual dog's personality comes alive in these pictures! Woof!! 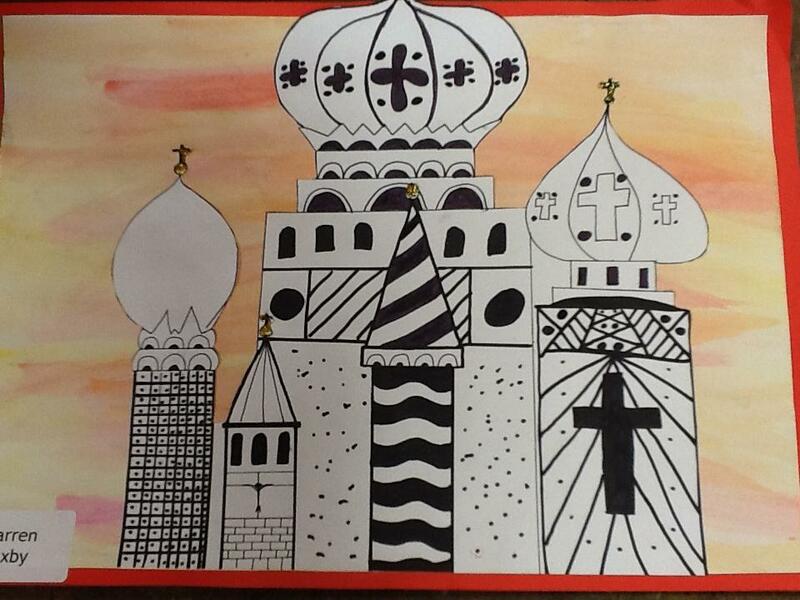 The Grade 6's looked at the amazing St Basils Cathedral in Russia that was commissioned by Ivan the Terrible. 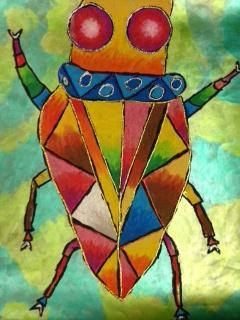 In this project pupils were not allowed to draw in pencil first. 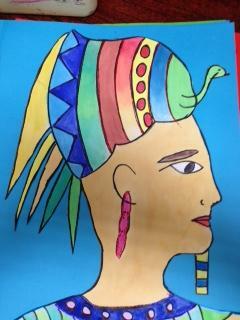 This was a very good learning experience for them and they learned that you cannot make "mistakes" in art! 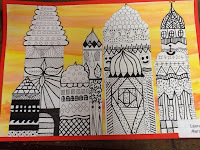 Incorrect lines could be made into interesting patterns and designs! 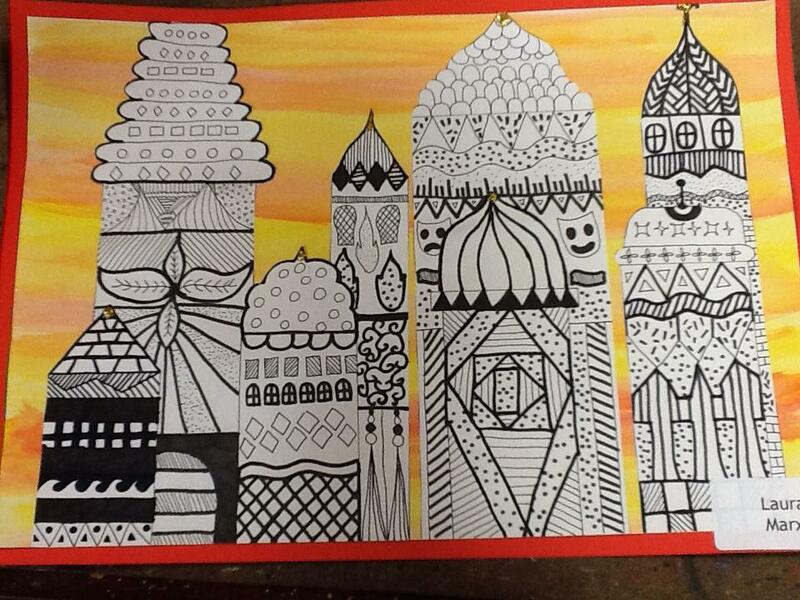 Repetition of patterns and shapes filled the buildings, while the background was painted in watercolours. 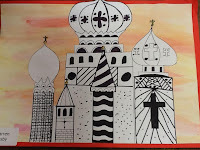 Crosses and domes sprang to life with gold glitter! 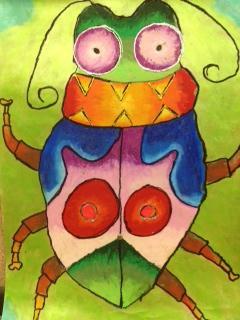 Well done Grade 6's! These were amazing! 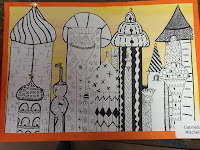 Thanks to deepspacesparkleblog.com for inspiration on this lesson. 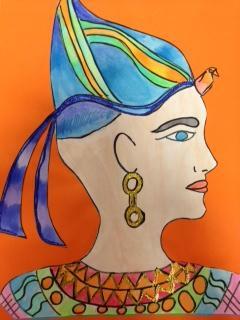 The Grade 5's completed these beautiful Egyptian portraits that were used as the decorations in their annual Egyptian Feast in watercolours. 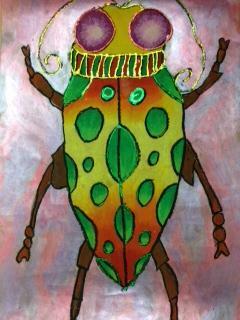 Pupils were encouraged to experiment with different shades of colour and blend these colours together to create different effects. I am sure you will agree that these are stunning! Gigantic Bugs - Bugs alive!!! 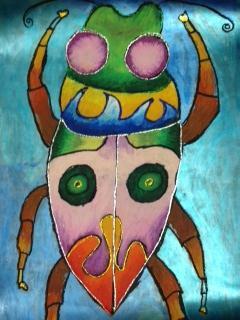 The Grade 4's completed these amazing bugs. Can you believe that this was the first time they were introduced to the concepts of Tone and Blending! And WOW!!....... 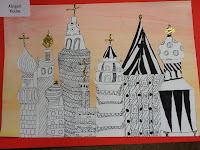 Did they apply these skills amazingly, messily and amid heaps of fun, especially whilst finger painting the background with two different tones of metallic paint! 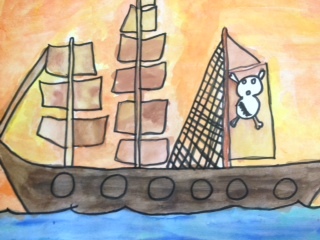 Pirate Ships - Ahoy there, matey!! 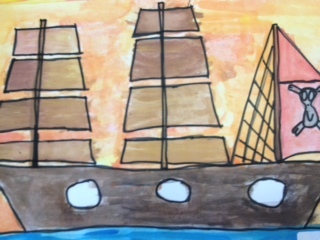 This project was an introduction to watercolour painting.The pupils used warm colours to creat a sunset in the background. 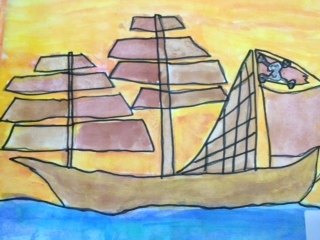 Shades of browns were used in the boat and blues and greens in the sea! 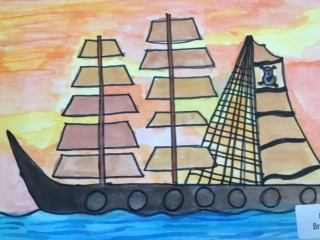 The result: Stunning Pirate Ships!! !